Hugh Pender has been hopping from one place to another for the past ten years. He has changed girlfriends as often as he has changed jobs, and he has certainly never felt compelled to settle down anywhere. It all began when he left his hometown shortly after his younger brother, Chase, died nearly a decade ago. Now his father has had a heart attack, so Hugh has returned home. 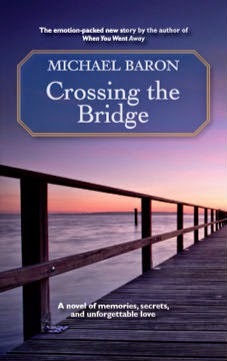 In Crossing the Bridge by Michael Baron, Hugh is quickly roped into taking care of the family store, a job he does not relish, and which cannot end soon enough for him. And then he runs into his brother's girlfriend, Iris, with whom he was once secretly in love. They haven't seen each other since Chase's funeral, and as they begin to build a relationship, they both realize they must face the past and reexamine the future. I thoroughly enjoyed this book. Despite being annoyed with Hugh a few times, I genuinely liked him and wanted him to be happy. The relationship between Hugh and Iris is wonderfully written: I could feel their love and their pain. And the interactions between Hugh and his parents seemed very real and honest. Even all the characters working and shopping at the family store were well developed. Baron does an excellent job of getting into a character, and allowing us to really see them and care about them. In addition, the story flowed very well. Written from Hugh's perspective, we experience his present-day actions and thoughts, as we are also brought back in time through his memories of his brother. The transitions from today to the past are very smooth and natural. Crossing the Bridge is an easy read, with lovely characters, and a beautiful story of personal growth and love. This review was written based on a copy of Crossing the Bridge that I received from the publisher, The Story Plant. This review includes an Amazon affiliate link. Please enter me, this does sound like a good one. Awesome review! Your review makes me want to read the book even more! Another book that you have read that I plan on reading this month. I read his book, When You Went Away and absolutely loved the book. I look forward to this read. Now, have I read your review. No, I will once I am done reading the book and my review is posted. I look forward to seeing what you think of this book. Such a lovely story! !Really looking forward to winning this book. Hope the contest is international....Thank you!